Dressing up bacon and making it fancy! Pre heat broiler to high. Prepare baking sheet by lining it with foil and lightly spraying with a non stick spray such as Pam. Mix all the ingredients except the bacon in a bowl and stir well to combine, breaking up any lumps. 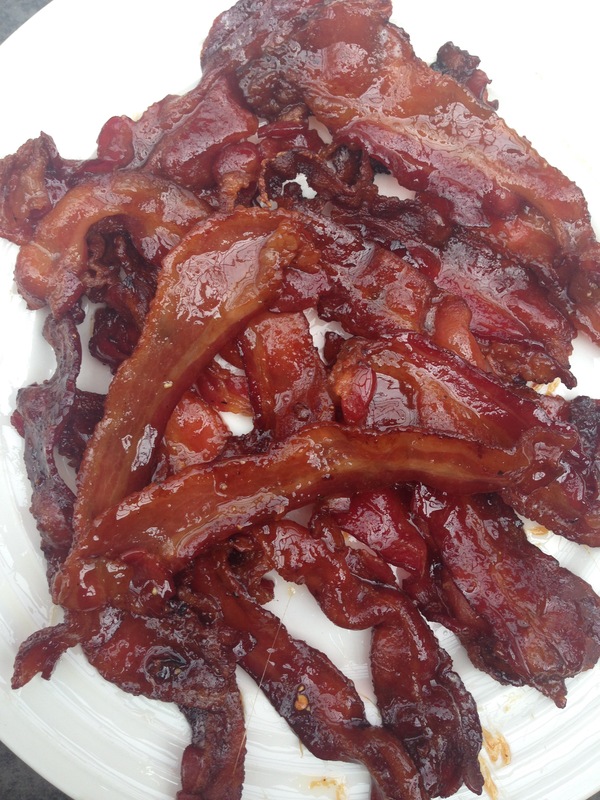 Place bacon on a microwave safe dish, (this may be done in batches), and cook on high 3-4 minutes. Bacon should be clear and much of the fat rendered. Careful drain off the fat and add bacon to bowl with mixed ingredients, toss and stir well to coat. The hot bacon will melt the brown sugar and the sauce should coat nicely. Lay the bacon out onto the prepared baking sheet and place under the broiler at least 5 inches away. Broil 5-6 minutes, or until brown and crisp, turning and basting with remaining sauce every 2 minutes or so. Watch carefully because you can very easily burn the bacon! Remove from broiler and allow to cool! The sugar makes this super hot to touch! So patience and restraint is a must!